Zug, Switzerland and Vancouver, Canada – HIVE Blockchain Technologies Ltd. (TSX.V:HIVE) (OTC:HVBTF) (the “Company” or “HIVE”) today announced its results for the third quarter ended December 31, 2017 (all amounts in US dollars, unless otherwise indicated). Return on investment of 36% by December 2017 through investment of $16,284,690 in data centre equipment since September 2017 which has generated digital currencies with a value of $5,827,805. Subsequent to the quarter, on January 15, 2018, HIVE commenced mining operations from the initial 6.8 MW phase of the Sweden GPU Data Centre, nearly tripling its global footprint of energy consumption dedicated to digital currency mining to 10.6 MW. This has contributed to a strong increase in the Company’s digital currency portfolio to a total value of $13,624,783 as at February 26, 2018. The construction and configuration of the second and third phases of the Sweden GPU Data Centre is proceeding on-schedule and will increase HIVE’s capacity by an additional 13.6 MW within two months, with the 20.0 MW Sweden Bitcoin Date Centre to follow by September 2018. In the quarter, HIVE acquired and launched operations of the second phase at its digital currency mining centre in Iceland. Included in the financial results for the quarter ended December 31, 2017 is a full quarter of operations from the initial 2.05 MW of mining capacity plus operations from the 1.75 MW expansion from October 13, 2017 which, combined, resulted in revenues of $3,274,186 and a gross mining margin of $2,382,687 (see Note 1). Total assets increased to $163,986,233 as at December 31, 2017 from $478,915 at March 31, 2017, due primarily to the completion of the transactions with Genesis and financings during the period. The significant assets of the Company at December 31, 2017 consisted of cash of $99,082,749, digital currencies of $5,827,805, a cash deposit of $32,000,000 for the Sweden GPU Data Centre, and computing equipment in Iceland of $15,250,404. The increase in total assets during the nine months ended December 31, 2017 results primarily from a net $150,100,974 raised from private placements, along with the mining revenue and revaluation of digital currencies of $5,827,805. Operating and maintenance costs for the three and nine months ended December 31, 2017 were $891,499 and $949,359, respectively, consisting of fees paid to Genesis under a master services agreement between HIVE and Genesis, which includes electricity, daily monitoring and maintenance, facility costs and all other costs directly related to the maintenance and operation of the Company’s mining equipment. The Company’s net income from continuing operations after tax for the three and nine months ended December 31, 2017 was income of $149,724 and a loss of $19,690,038; the nine month period ended December 31, 2017 included a one time charge of $16,340,247 related to the Company’s initial transaction with Genesis. General and administration expenses for the three and nine months were $3,283,833 and $6,826,171 respectively, which included non-cash charges for share based compensation of $1,827,024 and $4,533,663 for each of the three and nine months. Ongoing general and administration expenses relate to the Company’s rapid growth plan and compliance costs of being a public company. 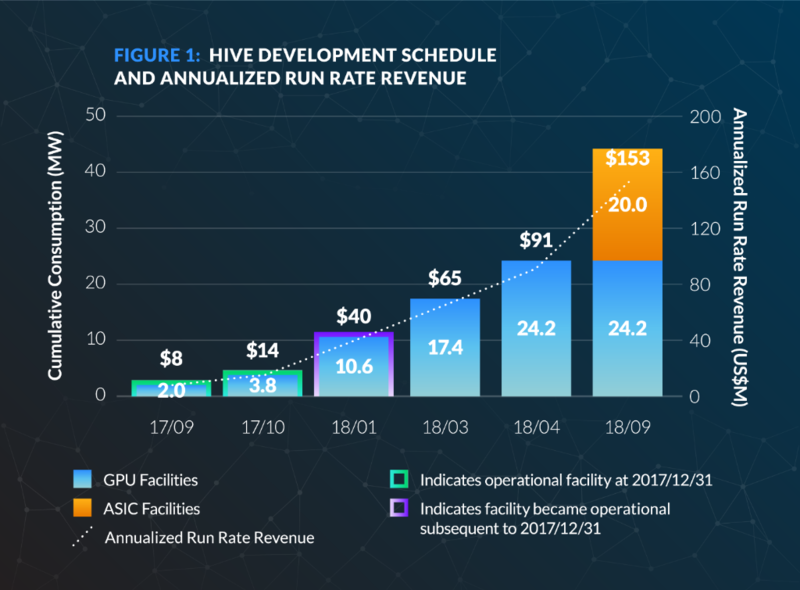 HIVE continues to execute on its aggressive growth strategy to maintain its position as a market leader in the blockchain infrastructure industry and is fully financed to build out and bring online the balance of the Sweden GPU Data Centre by April 2018 and the Sweden Bitcoin Data Centre by September 2018. HIVE’s annualized run rate revenue (defined below) is projected to be $153 million once its announced Sweden expansion is fully online, which is expected by September 2018. The annualized run rate revenue is calculated strictly on the basis of value of the digital currency earned at the time of mining, and does not include any adjustment for revaluation gains (or losses) for digital currencies held after that date. Please refer to the Company Management Discussion and Analysis for the third quarter ended December 31, 2017 available on www.sedar.com for a detailed analysis of the sensitivities of the underlying assumptions of digital currency prices and network hashrates used for the annualized run rate revenue. The following chart shows the growth in HIVE’s annualized run rate revenue for each phase of its announced 2018 expansion based on crypto prices and network assumptions noted below as of February 26, 2018. The increase in the annualized run rate revenue in each phase is primarily due to the increase in mining rigs and related MW consumption. The Company’s Financial Statements and Management’s Discussion and Analysis (MD&A) for the three and nine months ended December 31, 2017 will be accessible on SEDAR at www.sedar.com under HIVE’s profile and on the Company’s website at www.HIVEblockchain.com. Management will host a webcast on Thursday, March 1, 2018 at 5:30am Pacific Time/8:30am Eastern Time to discuss the Fiscal 2018 Third Quarter financial results. Presenting on the webcast will be Harry Pokrandt, CEO, President and Director and Jessica Van Den Akker, Chief Financial Officer. Analysts and interested investors are invited to participate. Click here to register for the webcast. The webcast will be archived for later playback on HIVE’s website. The Company has presented certain non-IFRS measures in this document. The Company believes that these measures, while not a substitute for measures of performance prepared in accordance with IFRS, provide investors an improved ability to evaluate the underlying performance of the Company. These measures do not have any standardized meaning prescribed under IFRS, and therefore may not be comparable to other issuers. As the Genesis transaction closed in September 2017, these measures are not available or meaningful for periods prior to this date. Gross Mining Margin: The Company believes that, in addition to conventional measures prepared in accordance with IFRS, it is helpful to investors to use the gross mining margin to evaluate the Company’s performance and ability to generate cash flows and service debt. Accordingly, this measure does not have a standard meaning and is intended to provide additional information and should not be considered in isolation or as a substitute for measures of performance prepared in accordance with IFRS. For further detail on the gross mining margin, please refer to the Company’s Management Discussion and Analysis for the third quarter ended December 31, 2017 available on www.sedar.com. Except for the statements of historical fact, this news release contains “forward-looking information” within the meaning of the applicable Canadian securities legislation that is based on expectations, estimates and projections as at the date of this news release. “Forward-looking information” in this news release includes information about the Company’s build-out and expansion of digital currency operations (including expansion into Bitcoin and Bitcoin Cash mining) into Sweden and expected timing thereon; the expected electrical and mining capacity in Sweden; the business goals and objectives of the Company, and other forward-looking information includes but is not limited to information concerning the intentions, plans and future actions of the parties to the transactions described herein and the terms thereon. This news release also contains “financial outlook” in the form of annualized run rate revenue, which is intended to provide additional information only and may not be an appropriate or accurate prediction of future performance, and should not be used as such. The annualized run rate revenue disclosed in this news release is based on the assumptions disclosed in this news release and in the Company’s Management Discussion and Analysis for the third quarter ended December 31, 2017 available on www.sedar.com, which assumptions are based upon management’s best estimates but are inherently speculative and there is no guarantee that such assumptions and estimates will prove to be correct. Factors that could cause actual results to differ materially from those described in such forward-looking information include, but are not limited to, the construction and operation of the digital currency mining centre in Sweden may not occur as currently planned, or at all; the ongoing partnership with Genesis; the quantum of electrical consumption and mining capacity at the digital currency mining centres in Sweden may not materialize as currently anticipated, or at all; the digital currency market; the Company’s ability to successfully mine digital currency; revenue of the Company may not increase as currently anticipated, or at all; the Company may not be able to profitably liquidate its current digital currency inventory, or at all; a decline in digital currency prices may have a significant negative impact on the Company’s operations; the volatility of digital currency prices; and other related risks as more fully set out in the Filing Statement of the Company dated September 13, 2017. The forward-looking information in this news release reflects the current expectations, assumptions and/or beliefs of the Company based on information currently available to the Company. In connection with the forward-looking information contained in this news release, the Company has made assumptions about the Company’s ability to complete the construction of digital currency operations in Sweden; the Company will be able to profitably liquidate its digital currency inventory as required; the Company’s ongoing partnership with Genesis; historical prices of digital currencies and the ability of the Company to mine digital currencies will be consistent with historical prices; and there will be no regulation or law that will prevent the Company from operating its business. The Company has also assumed that no significant events occur outside of the Company's normal course of business. Additionally, gross mining margins referred to in this news release are also based on assumptions set out herein and in the Company’s Management Discussion and Analysis for the third quarter ended December 31, 2017 available on www.sedar.com, which assumptions are based upon management’s best estimates but are inherently speculative and there is no guarantee that such assumptions and estimates will prove to be correct. Although the Company believes that the assumptions inherent in the forward-looking information are reasonable, forward-looking information is not a guarantee of future performance and accordingly undue reliance should not be put on such information due to the inherent uncertainty therein.